At Skyway Grain we specialize in designing, selling and constructing grain handling systems. The systems are designed featuring the Hutchinson Grain Pump(TM), a continuous loop grain moving system chosen for its incredible durability, efficiency, and maintenance free qualities. If you are interested in a Skyway dealership please read through this section of our web site to learn the benefits of a new business and our requirements for Skyway Dealers. You can complete an online form telling us about your company and why you would be interested in this business opportunity as a Skyway Dealer. At Skyway Grain Systems Inc. we look for very specific qualities in our dealers. The following list of questions gives you some idea of what we’ll want to know. Please take some time to go over this information before contacting us. Thank you. Does your company have the ability to communicate in English? Does your company manufacture grain handling equipment? How experienced are you in the grain handling industry? What product lines does your company currently carry? What is the size of your company, both in number of employees and current revenues? How big a market or territory do you currently cover? Does your company currently import? Is your target market commercial operations or smaller farm operations? 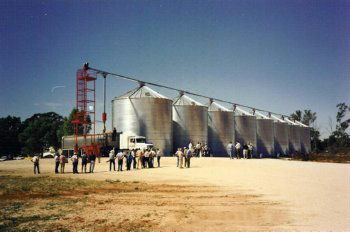 Skyway Grain Systems Inc. is the primary seller of grain handling systems featuring the Hutchinson Grain Pump(TM). Our systems offer cost and time savings which can’t be had with any other system. We use only top quality suppliers and design top of the line systems. Selling our proven systems in your country will generate attention for your company or dealership. In addition, selling grain handling systems naturally creates a market for storage solutions, which also benefits your dealership. Skyway systems are designed simply, with few moving parts, and because of the high quality of the components, the overall system is easy to maintain and service.